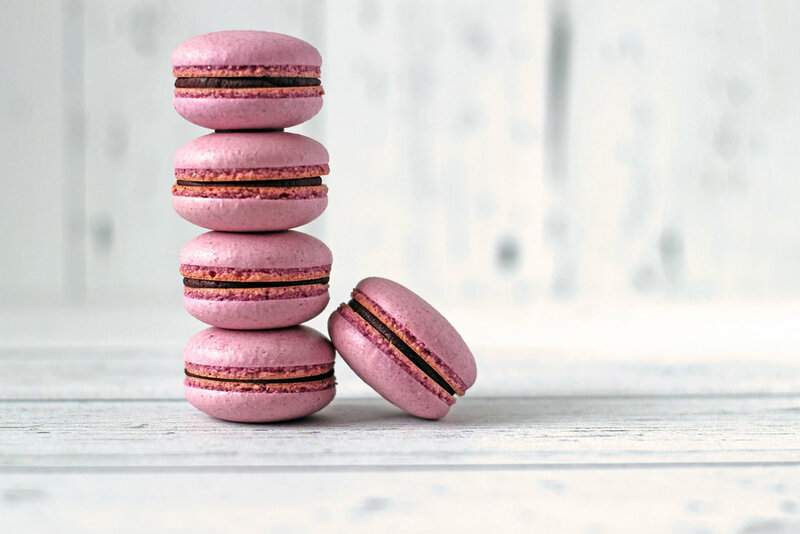 For this post I created raspberry macs just because raspberry/chocolate is a favorite of mine, but you can use many different flavours to make these, or even just add cocoa powder and you'll have a delicious fudgy mac. So what did I use to incorporate the raspberry in the macaron shell?? Freeze dried fruits! I use them everywhere I want to incorporate intense fruit flavour and the natural colour of the fruit. There is no artificial flavour or colour in these beauties but yet they are super flavourful and bright! There are two different methods to make macarons, the french method or the italian method. First, let's talk about the french method in which the sugar-almond mixture is added directly to the egg whites to make the meringue. This method has one step less than the Italian method and might seem a easier. In all honesty it is a little more straight forward but, for me, the results have been inconsistent (at best) and they have failed more times than they have succeeded. The italian method uses an italian meringue (duh...). That means that the sugar is cooked with a bit of water until it reaches a firm ball stage (that's the stage that would give you a soft chewy caramel candy, 118°C - 120°C). That cooked sugar is then added to the egg whites to make the meringue. I've had so much more success with this method that it's the only one I use now. Here's the recipe, hope you give it a go. Let me know how they come out! In order to simplify this recipe, I'll represent it in three parts. The almond-icing sugar mixture is the first thing that needs to be prepared. This mixture needs to be very smooth so the top of the macarons aren't rough and bumpy. In order to do this, grind the almond flour, icing sugar and dried freeze raspberries together in a food processor, then strain through a fine mesh sieve. If you have a lot of leftover pieces that didn't go through, put them back in the food processor, grind again and pass once more through the sieve. Once this process is finished, put the mixture in a big and large bowl (the larger it is, the easier it'll be come mixing time) and mix in 75 g of the egg whites. Reserve the mixture. Get the other 75g of egg whites ready in your mixer bowl, but don't turn it on yet. You can start whipping them on medium high speed when your sugar has reached the soft ball stage (around 114°C), but we'll get back to that in a little bit. Place the 200 g of sugar and 50 mL of water in a small, heavy bottomed saucepan. let cook on medium-high heat. when the mixture reaches 114°C, turn on the mixer and start whipping the egg whites. Continue cooking the sugar until it reaches 118°C-119°C (by now the egg whites should be at least frothy if not holding soft peaks). Remove quickly form the heat, turn down the mixer speed to low and spill the sugar on the sides of the bowl. Increase, once again the speed back up to high and let the egg whites whip up to a stiff meringue. Now, that meringue needs to be incorporated in the almond-sugar mixture in two stages. At first, add about 1/3 of the meringue and mix it in with the almond mixture. This will loosen up the whole thing and make folding in the rest easier. Add the rest of the meringue and fold gently until everything is incorporated. Now comes the tricky part. The batter needs to have the right consistency for the macarons to come out looking pretty and not hollow or cracked. Most of the recipes I've read or seen online, describes the batter as being able to flow off the spatula like ribbon (in a straight thick line off the spatula and doesn't fall in directly with the rest of the batter, it takes a couple of seconds for it to mix in with the rest). But I've had better results when I stop right before that. That means that it almost falls off the spatula at a ribbon stage, mine is a little more clompy (if that is a word). Why? Because the batter will continue to be manipulated when you put it in the piping bag, when you pipe it and it tends to loosen up a little more with all of those actions. So, when all the meringue is incorporated just continue folding the mixture if it's too thick, it will loosen up and get to the desired consistency. You can now transfer the batter to a piping bag with a round tip (I use a #10 tip but you can use a #12 also if you like). Be sure to pipe them at a 90°C angle so they don't come out lopsided. You can pipe them on silicone mats or parchment paper. If you use parchment paper, you can trace the outlines of the circles and flip over the paper if you want them even looking. If you're using silicone mats and they don't have templates on them, you can draw the circles on parchment paper, place it under the silicon mat and remove it to use on the next one. Tap the cookie sheet a couple of times on the counter, if you notice air bubbles on the surface, you can pop them with a pin. Let the macs air dry a bit before putting them in the oven. When you can touch them without your finger getting wet or sticky, they are ready to head in. Bake for 8 minutes, rotate the baking sheet and continue baking for another 8-10 minutes until the macarons aren't giggly when you try to wiggle them slightly. Let them rest at least one hour before removing from the baking sheet. When using a silicon I like to push them from the bottom to help release them. Here's a quick step by step that I did on my instastories, hope it helps. Mix both ingredients in a microwave safe bowl and melts in increments of 30 seconds so that the chocolate doesn't burn. If you feel the bowl getting hot let the mixture rest, the heat from the bowl will continue the melting process. Once everything is melted together and is smooth, let the ganache thinking to a spreadable consistency (think peanut butter). You can let it happen at room temperate if you have the time or in the fridge to speed up the process. Once thickened, spread or pipe some ganache on one macaron shell and sandwich with another. If you want to make tis recipe for passover and you can't find freeze dried fruits, you can always replace the fruits with cocoa powder and you'll have a delicious fudgy macaron. If you want a plain macaron shell, your quantities change as follows: 215 g almond flour with 215 g icing sugar.